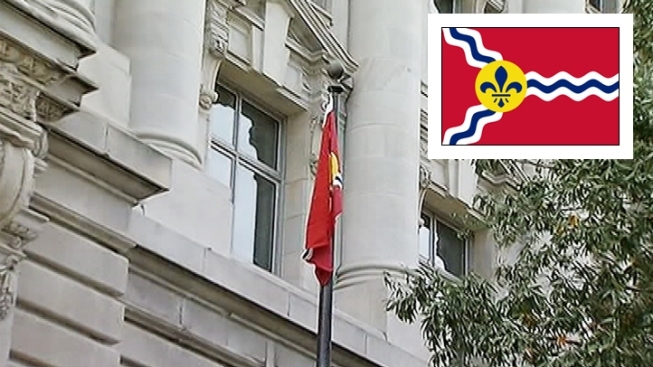 The St. Louis flag (also pictured in inset) flies over the John A. Wilson building Wednesday. If the sting of the Washington Nationals being knocked out of the playoffs by the St. Louis Cardinals has faded, don't worry, today the D.C. government will remind the city's residents of the blow. Thanks to a bet placed by D.C. Mayor Vincent Gray and St. Louis Mayor Francis Slay, the St. Louis flag is going up over the District of Columbia's main government building for the day, starting at 9 a.m.
Gray and Slay made the flag-flying wager during baseball's National League Division Series. The Nationals lost the series, which means the St. Louis flag is being flown at the John A. Wilson Building on Wednesday. The St. Louis flag has a red background with a blue fleur-de-lis in a yellow circle and three squiggles of blue and white that represent the rivers that come together near St. Louis. Nats fans may take some small comfort in the fact that the Cards ultimately lost the National League Championship Series to the San Francisco Giants on Tuesday night.